Enjoy Kraft Pepper Jack Monterey Jack Cheese Blocks with Jalapeno Peppers! 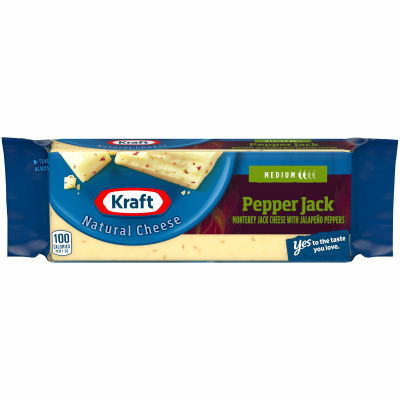 With a medium heat, this pepper jack block of cheese is made with natural Monterey jack cheese with jalapeno peppers. We rate this 2 out of 4 peppers on our heat scale. Each block of natural cheese has rich, full flavors perfect for any dish. Shred the cheese for your favorite recipes or cut off slices for entertaining. Always made from fresh milk, Kraft natural blocks of cheese are perfect for your family. For over 100 years, Kraft has been making the cheese your family loves. So, no matter how you like it, we’ve got a cheese for you.